Birthplace Billiluna Language Walmajarri Domicile Emu Creek, Kununurra WA. Eastern Kimberley Region. Title Sturt Creek – Start of the Wet. This painting depicts country on Sturt Creek near Lake Gregory (Barragoo) in the Great Sandy Desert. When the monsoonal rains come the Sturt Creek floods. The small circular shapes in the centre are grass islands. The white area around the edge of the painting is the flood water at the beginning of the wet season starting to fill the many waterholes. The artist describes this water as ‘milk water’ dirty water washed down from the dry creek beds. Nellie paints topographical landscapes of her home country and the many places she and her late husband have seen, as well as beautiful depictions of women’s ceremony sites – always with a paint brush in one hand and ‘a cuppa tea and biscuits’ close by. East Kimberly region. Second tier artist. Demonstrates how work can be viewed carta logically, as in flying over in aeroplane or horizontally, or combination of both, the bungle bungle hill shapes with creeks and pathways in strips in between. Nora was born and raised at Turner Station in WA near the NT border. As a young girl she worked on the station performing domestic tasks and then moved into Halls Creek in the 1960’s when government intervention forced Aboriginals to leave stations. It was at Halls Creek that she started to paint. Her country is the subject of her paintings. 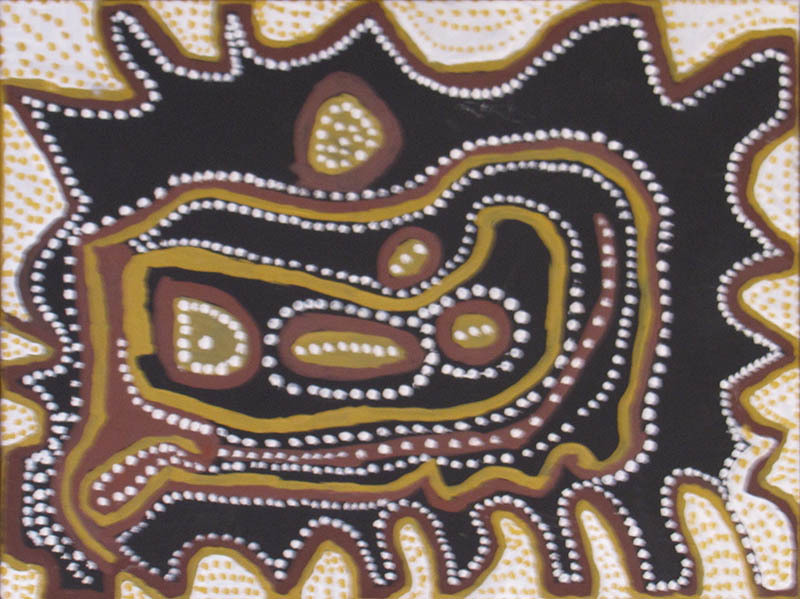 This work is made up of dots of varying ochre colours and she has captured the contours of her country in the rhythmic patterns made up of these marks. After a leaving leprosarium, got better approx. 2006-8 and travelled to Paris to paint directly on the roof of the Musee du quai Branly, chosen as one of the significant artists to represent Australia. Ceramic mosaic outside the entrance, her works copied onto the ceilings in main foyer and bookshop. Lena was born near Warnmarnjulugun lagoon in WA. Like other young girls, Lena was put to domestic work on a station from a young age. She began painting at the Warun Arts Centre at it’s inception in 1998 and she has developed an international reputation as an original and dynamic painter. 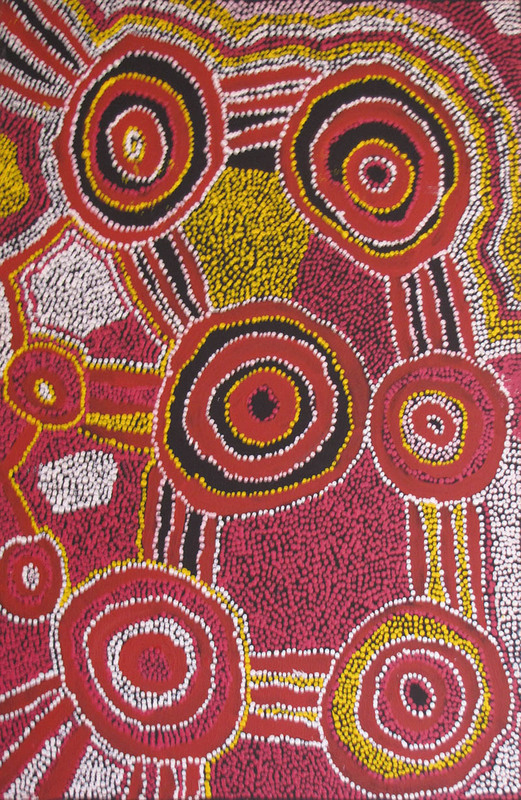 Kayili Artist Western Desert Region WA. Has exhibited 2007 Western Desert Mob, William Mora Galleries Melbourne. Represented in collections including Artbank, James McCourt, Marshall, Kelton Foundation. 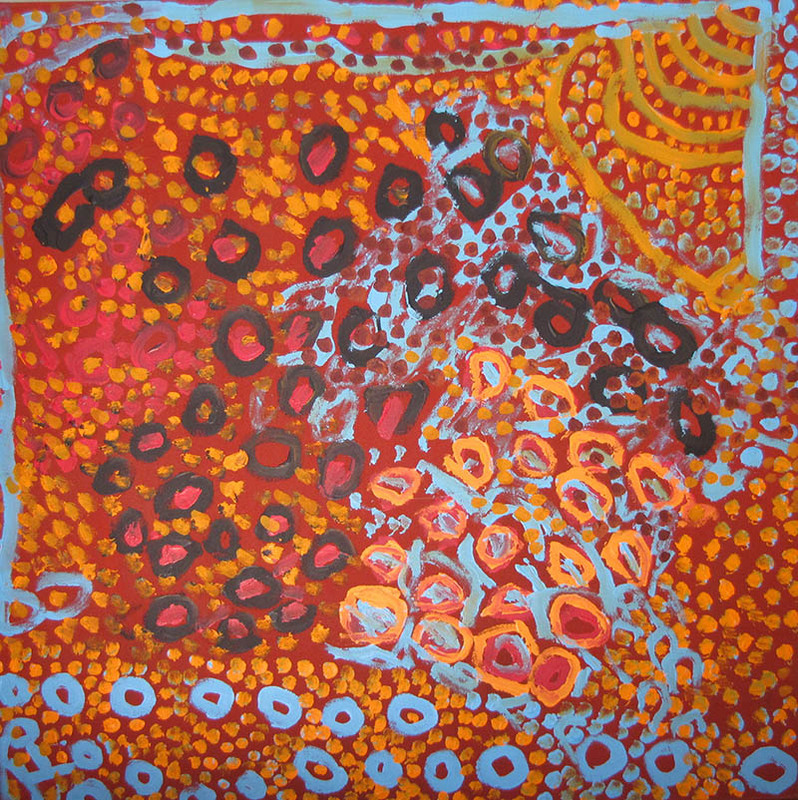 This is a painting of country, sacred sites and songlines all interconnected. Tommy Mitchell was born in the dessert the Warakurna side of Papulankutja, a small community Central East, WA, work acquired through the from the Warakurna Artists, a local community arts co-op. Ref to painting ‘Wati Tjukurrpa’ “Too many lakes this side of Ngaturn, there are clan pans there. It’s a business place, nothing more can be said” as explained by Mr Mitchell. His country was Ngaturn and Walu. He was a senior lawman and major painter with Warakurna Arts. 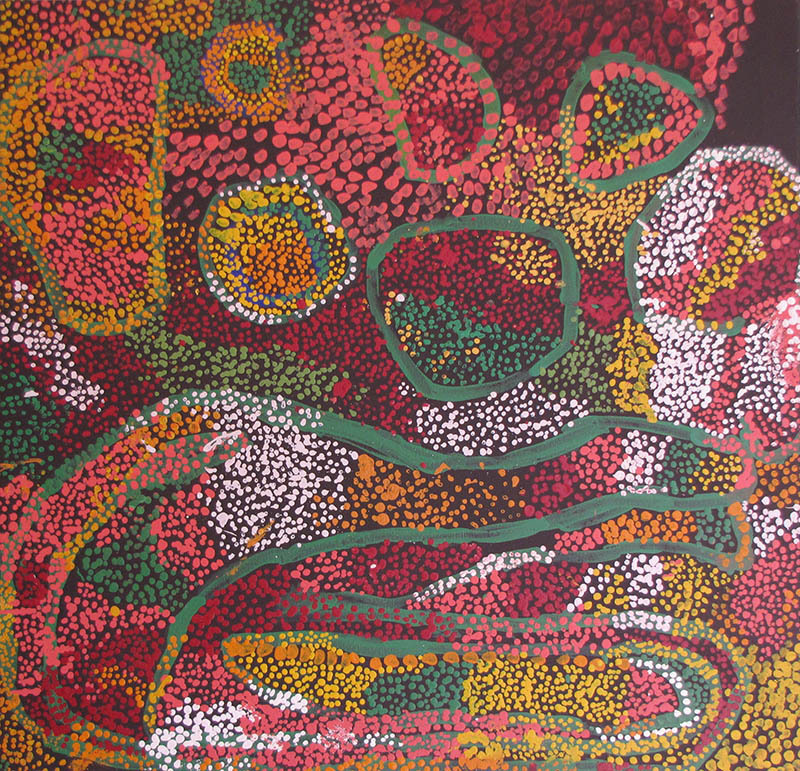 Mitchell’s paintings depict the Tjkurrpa (dreamings) and stories of his mother’s and father’s country, which he has passed down to his children. Tjukurrpa is the core of desert tradition and expresses the larger spiritual and social dimension of the life of Aboriginal people. Bai Bai is a senior law woman at Balgo who spent her childhood and early adult life journeying through her family’s land learning traditional culture and law. For cultural reasons she has travelled extensively and in 1989 she danced at the Shinju Matsuri Festival in Perth. She started to paint in 1986. From Balgo, northern. 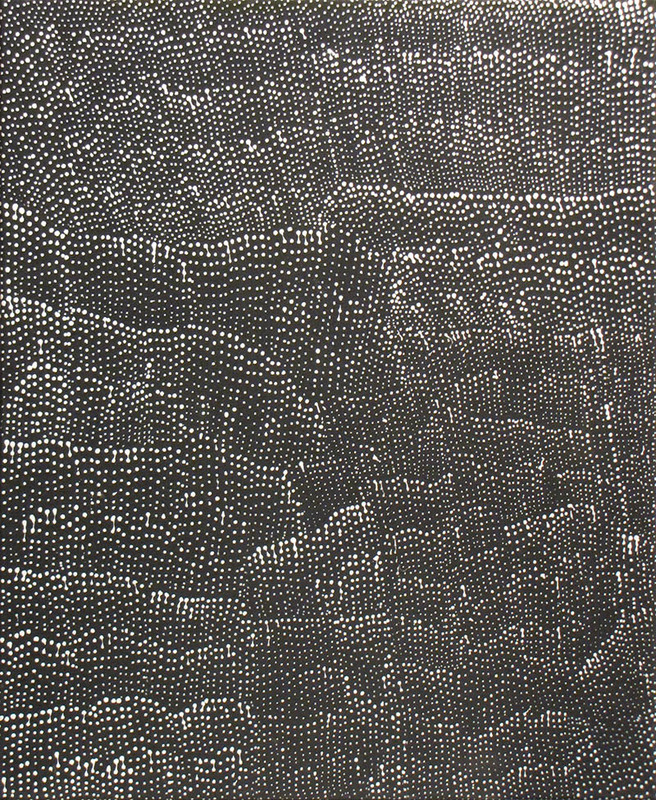 The work Parwalla has a distinctive texture, where the artist has chewed on the wooden end of the paint brush, then wait till the paint is partly dry and apply with a put on/ pull off technique. She is a major figure in Western Desert Art and demands people bring her paint. She grew up with her family group in their land, walking the Canning Stock Route as a teenager and into the old mission. She trained as a domestic worker, working on stations around the region and began painting in 1987, emerging as a leading artist in the 1990’s. Nyumi focuses on culture and dance and is enthusiastic on passing these attributes onto children, ensuring traditional dances and songs are kept alive by the next generation. A collaborative piece between husband and wife who had an unusually strong bond and travelled together in both men’s land and womens land. With his reducing eyesight, Nola became more involved with the in fill fields, developed further to doing more of the design and work. 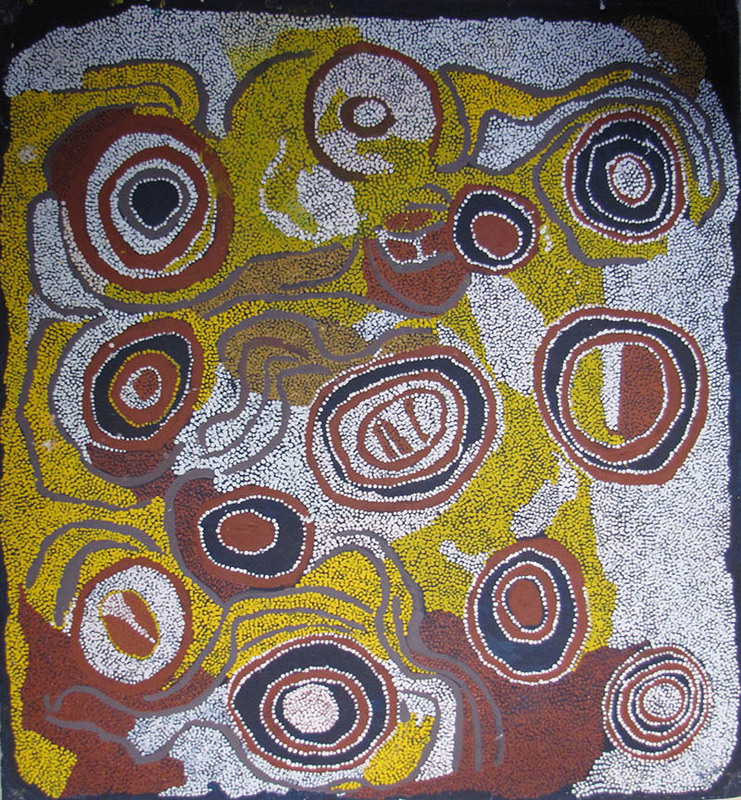 This painting Kapitu Kapitu perhaps demonstrates ‘his’ central black circle with blended colour, which differs from the other circles of solid colour. Born at Wuru, south of Yaka Yaka in WA. She was one of the senior elders and dancers at Balgo. She lived a traditional life in the bush until her family moved into the old Balgo Mission. 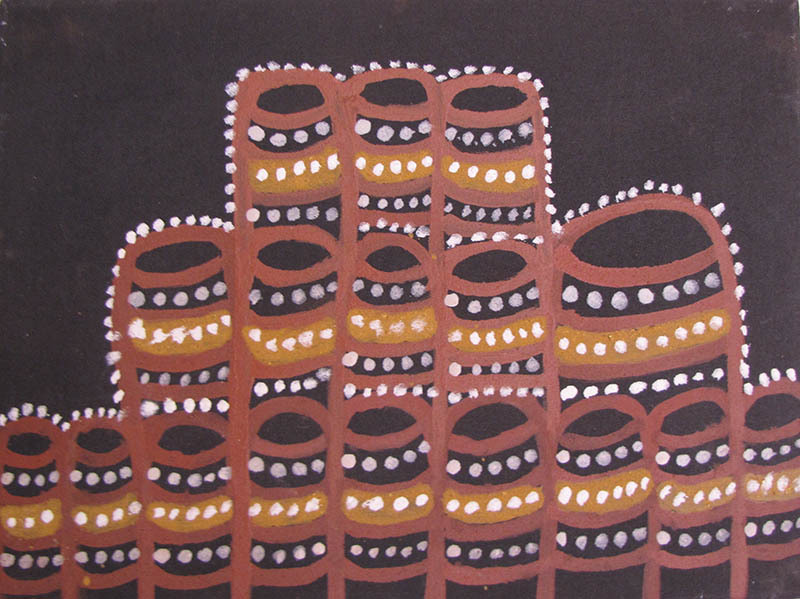 Mudgidell was involved in several publications, such as Yarrtji: Six Women's Stories from the Great Sandy Desert (1997, Aboriginal Studies Press, Canberra), which was shortlisted for the NSW Premier's History Awards in 1998. 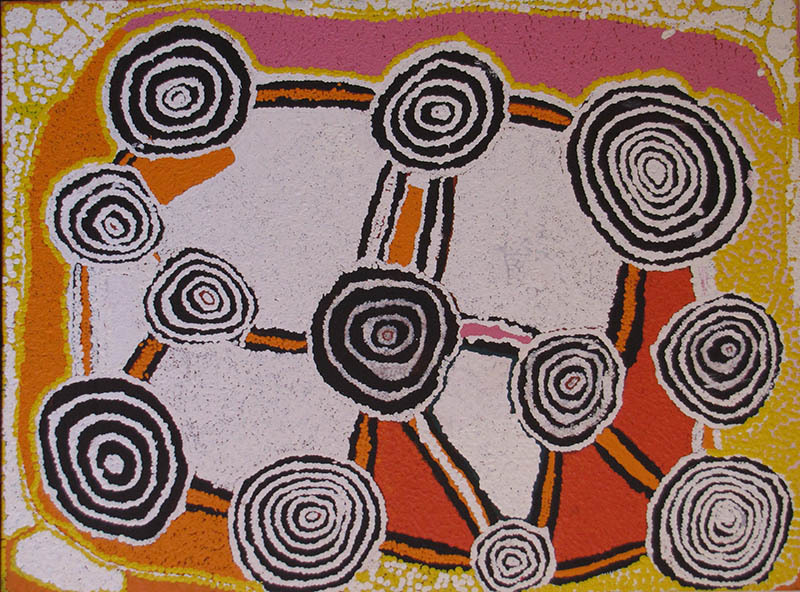 In 2002, shortly before her death, Mati's work was featured in a two-person exhibition at Aboriginal and Pacific Art Gallery, Sydney. 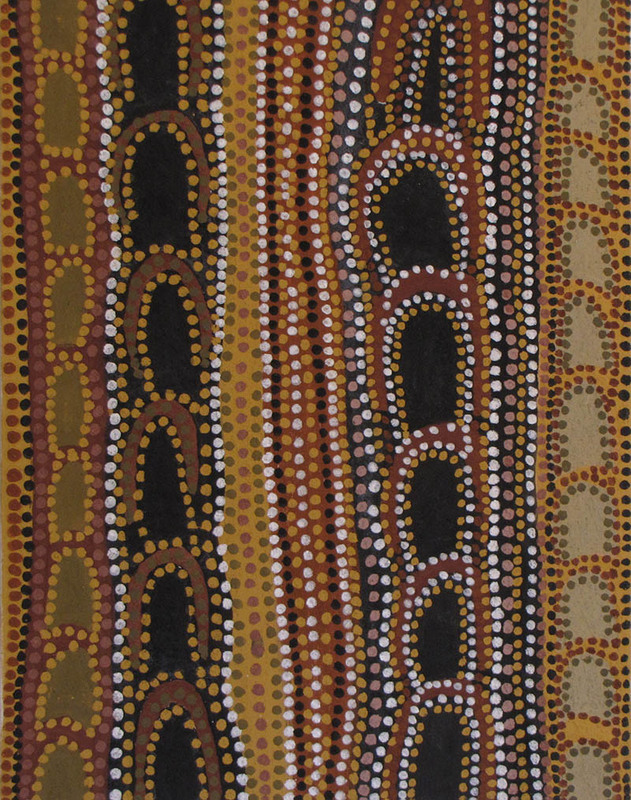 Kuntjil Cooper was born near the Irrunytju waterhole and paints her country. 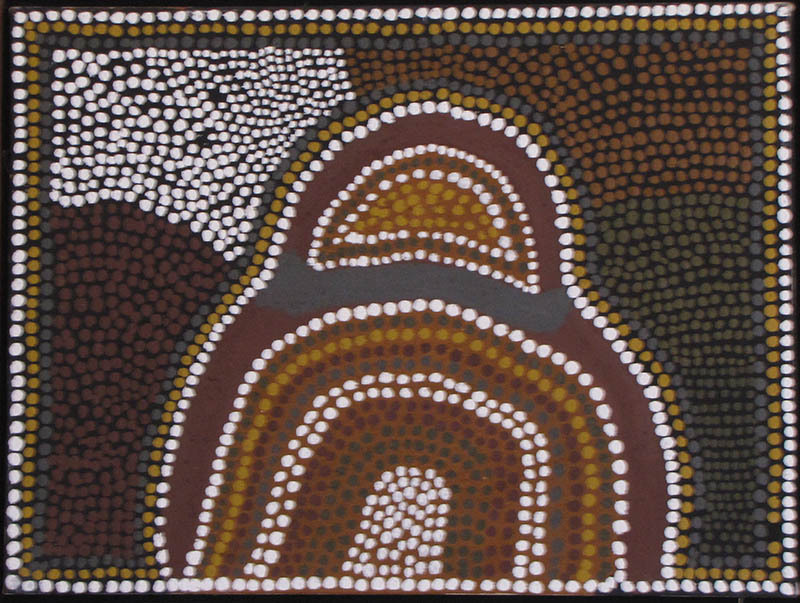 Minima Kutjara is one of the most important women’s creation stories of the Western and Southern Desert and is a special story for Irrunytju. It tells the story of a difficult journey by two sisters who travelled through these vast lands. They travelled north for the older sister to introduce the younger to her family. They walked and walked and walked, only stopping to dance and sing and to hunt and sleep. The little sister was frightened. She cried and the older sister carried her on her back and told her stories to assuage her fears. The places the sisters journeyed and rested can be traced through the desert with their actions creating landmarks – rock holes and mountains. Near Irrunytju the sisters sat on two mountains and in preparation for important women’s business threw their digging stick which created the waterhole there. Papunya Tula Artists. Umari, 107 x 28cm demonstrates a typical standard shape of canvas that could be viewed vertically or horizontally, and was designed to be manageable size to work while sitting on ground. A well known artist who was involved in the ‘Minyma Tjukurrpa Project’ and became one of the principal painters at Kintore. Southern end Tamani, near Great Australian Bight. A senior artist, where knowledge gives authority, one of Spinifex Arts Project, which came into prominence with their first exhibition in 2003, work initially fairly rough but developed quickly and his work is highly sought after. Kurlpuruu, demonstrates typical male motifs, solid, not heavily layered, compared to women’s painting which is often multi layered. 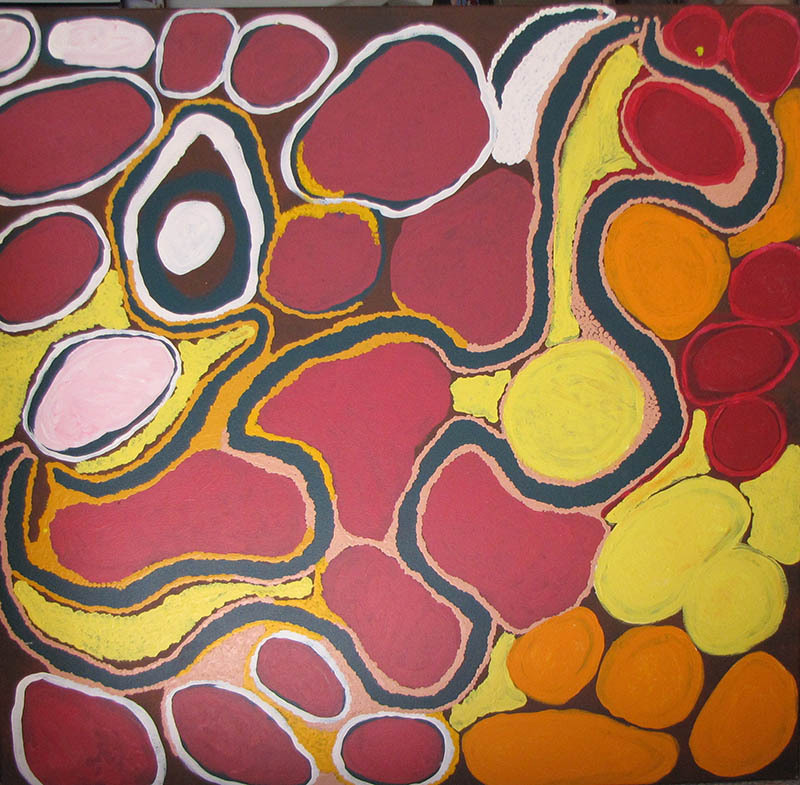 Painting shows rock holes and paths/ songlines that lead between with country or sand hills between the lines. After a traditional, nomadic upbringing in the bush with her family she moved to the then Christian mission of Warburton in the 1950’s. She began painting in 2000 and her work, which mixes modern painting techniques with ancient designs and cultural law, is now held in the collections of the Australian National Gallery, the National Gallery of Victoria, Art Gallery of Western Australia and the Queensland Art Gallery. This work is a representation of the Seven Sisters Dreaming. The scared Seven Sisters were being chased by the unwelcome attentions of a man so they hid and ran away. He tracked them and chased them across the desert. He is chasing them still where they can be seen today in the evening sky, still running. Also known as ‘Miss Bates’ she was born in the east Gibson Desert, Western Australia and has been painting since the early 1990’s. She paints important stories from her mother and father’s country for Warakurna Artists. 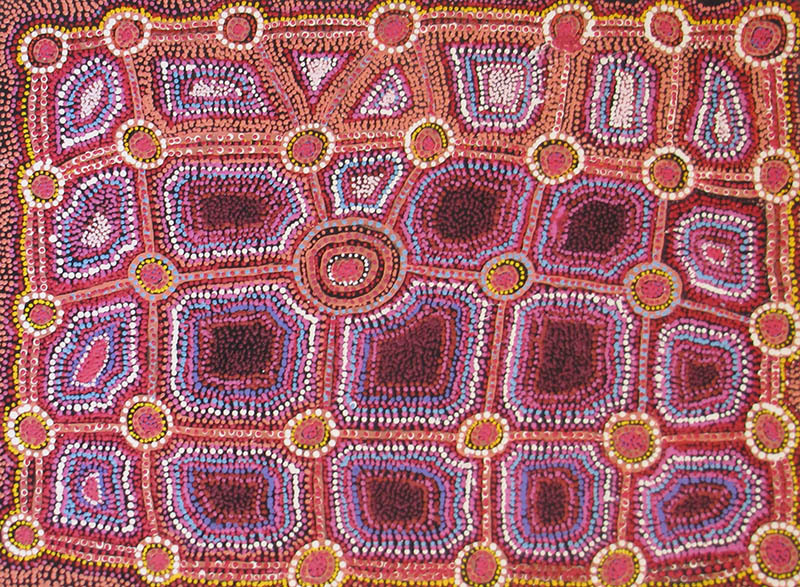 This colourful and bold work tells the story of the ‘7 Sisters Dreaming’ – this is the star cluster known in western civilisations as ‘Pleiades’ which is easily observed from central Australia. This star group rises just above the horizon soon after sunset and keeps a low trajectory above the horizon. Because of this, every evening the 7 sisters who are being pursued by the unwelcome attentions of a man from a different skin group, and is as such forbidden to marry any of the girls, in their quest to run away seem to launch themselves from the land and into the night sky to be pursued by the man, represented by a star from Orion’s belt cluster. Stories associated with the stars and night skies carry meanings which probe deeply into the law and culture and social structures of the Aboriginal people. Ninuka Artist SA. Unusual work in that it demonstrates the artist using her fingertip to apply paint, and not changed sticks when using sticks to create muted and subtle mixed tones. Freedom of expression. Irrunytju is located close to tri state border of NT/WA/SA border in the Wingellina Hills. The landscape is arid, dry and very remote. Born at Nyumun in Great Victoria Desert, she is closely connected to the Tjuntuntjarra people. She now lives and paints in Warbuton. Nyumitja is still teaching the young women the stories of her mother and the ceremonies that she knows, and often travels out bush and on long trips to visit sites, sing songs and tell stories. Group Exhibitions 1993 Yarnangu Ngaanya-Our land Our Body, Perth Institute of Contemporary Arts. This important early Kimberley painter was a legendary stockman whose inspiration as a painter began later in life. 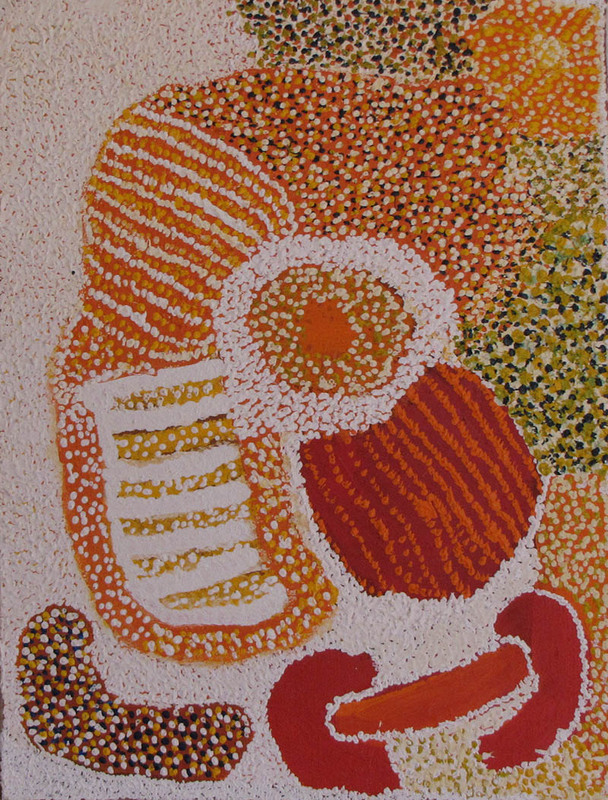 As a senior elder, his repertoire of the myths and legends of the Dreamtime was endless and provided a firm base for his visual and descriptive canvasses. Until his death in 2002 he was direct in the line of succession of traditional owners of he Bungle Bungles. This work is a simple representation in natural ochres of the Bungle Bungles – one of the most striking landscapes in Australia. 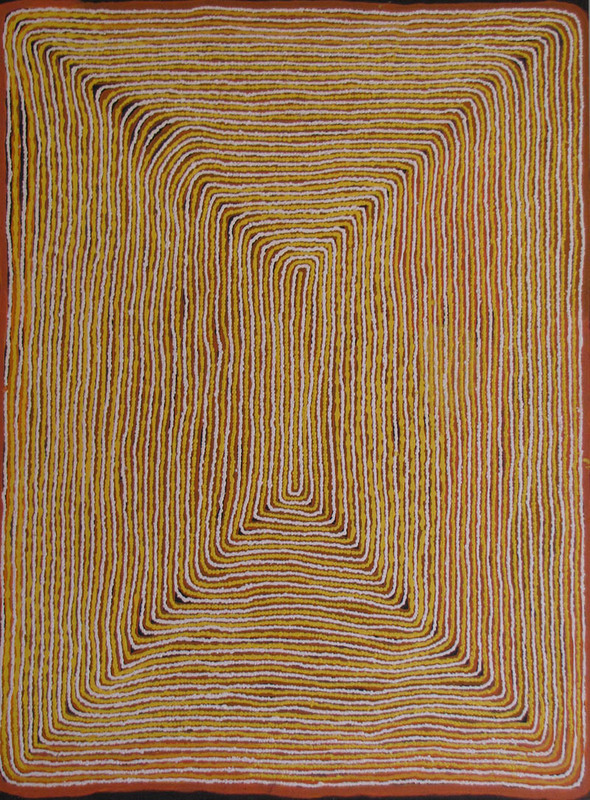 Painting Tingari Tjukurrpa presents a typical male work with red circles representing ceremonial sites, rock holes and songlines connecting. Work done while visiting West Warrakurna. Having no contact with colonists until his teenage years, George then moved to the government settlement of Papunya where he worked briefly as a fencer and butcher in the community kitchen. From there he and his wife and children relocated to Warburton , Warakurna and then Kintore. He is a senior desert man who lives deeply involved in its law. Over time, George has developed his own distinctive style with rapid, shaking dots which produce a shimmering surface.